Dressed in a white linen suit, sat on the veranda of my club in Chandrapore, sipping tea and looking over to the mist-wrapped hills in the distance I think wistfully about my unfilled ambition of being an artist in 1920s Paris or writing the great American novel. Then, as I listen to filmic music on my headphones, staring out the window of a train as we speed through the countryside. The camera pans out and the credits roll. This behaviour annoys my children and wife, especially when I call the steward to have them removed from first class and sent back to their seats. Emotions, memories and feelings are stirred by music, smells and taste because, like them, they are abstract, fleeting and ephemeral. Much in the way a cold, crisp autumn morning with blue skies takes me back to a feeling of warmth and happiness I can’t quite place, a good plate of comforting food is full of nurturing care, rather like going home to your parents for the weekend. I didn’t really start eating Indian food until my teens, to my memory. I don’t even remember my first curry. But now, ginger, garlic, turmeric, curry leaves, chillies, cumin, coriander are my magnificent seven and the flavours seem still so exotic and full of mystery that it is a full-on obsession. Wherever I am there’s never a spice to far behind me and this dish is an example of that. 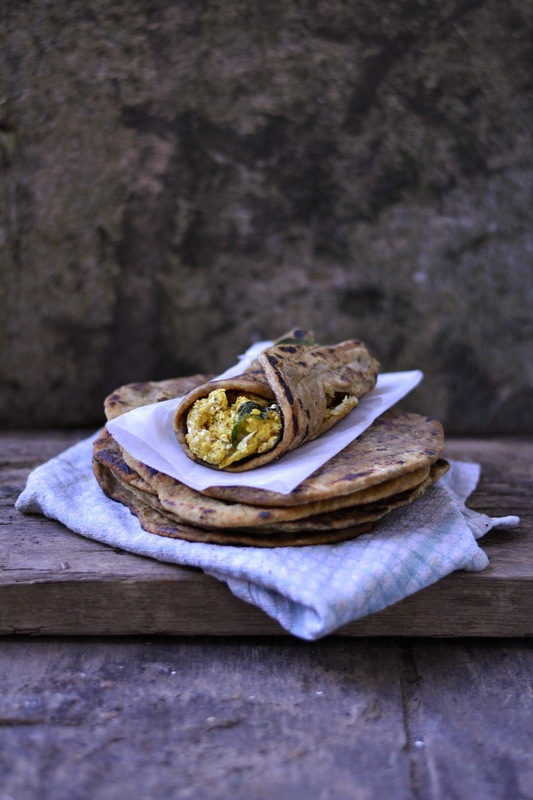 Why have standard scrambled eggs when you can have Indian scrambled eggs? And being Hallowe’en, I’ve made some flat breads using roast and puréed pumpkin in the dough, a technique I saw in Delhi. (On the telly). It gives the bread a great springiness and delicate sweetness, and it’s a slightly different way to use the flesh hollowed out from the lantern. The proof of the pudding is in the eating. And while this is not pudding and I have nothing to prove, the only way you’re going to understand how delicious this dish is, is by making and eating it. I urge you to do this as soon as you can. This is an immediate addition to the family canon, one of those things that will be regularly in demand, although mostly it’s eaten as scrambled eggs on toast, which makes it a five minute meal. If you do make the flat breads, make a batch and freeze them then when you want some, heat them in the oven and douse generously in melted ghee. All that melted butter should help offset the health benefits of the pumpkin. A kind of reverse food version of carbon offsetting. It is, after all, about balance. If you’re making the flatbreads, crape the flesh from the pumpkin and purée well. Mix all the ingredients together and knead well. Add a little more water if too dry. They should be soft, pillowy and springy, not sticky. Divide into balls and roll out into circles. Heat a cast iron pan and fry each flatbread in some ghee. Wrap in a towel as you finish the rest. Gently heat a heavy bottomed pan and add some oil. Throw in the curry leaves and cook for a few seconds. Stir in the garlic, ginger and spices then add the eggs and season. Stir gently until they start to set and add the chillies. I like to keep mine very soft. Add the coriander and served rolled in a flatbread or on some good strong wholegrain toast. Go and make this now. No arguments. Lovely writing in this post, it made me feel exotic just reading it! Beautiful introduction to what looks like a sublime, savory dish….i’m eager to try this. Thank you for the post and recipes! Nic, this sounds delicious – hope all is well buddy.